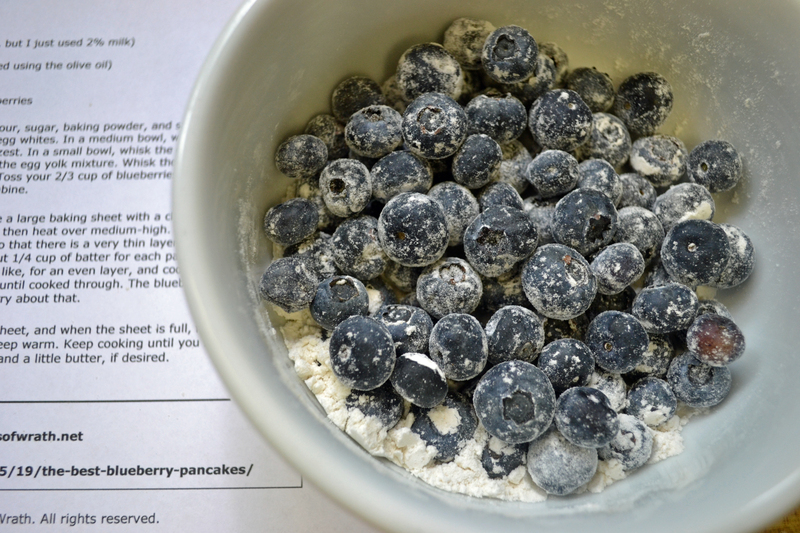 Over the weekend I made blueberry pancakes, and as I printed out the recipe, realized I didn’t have any milk. So I took this best blueberry pancake recipe, but subbed in one 12 ounce can of evaporated milk. They were delicious! She said she got 15-18 large pancakes, I got 13 large pancakes – each one comes in at 5 points plus, but really one is plenty. 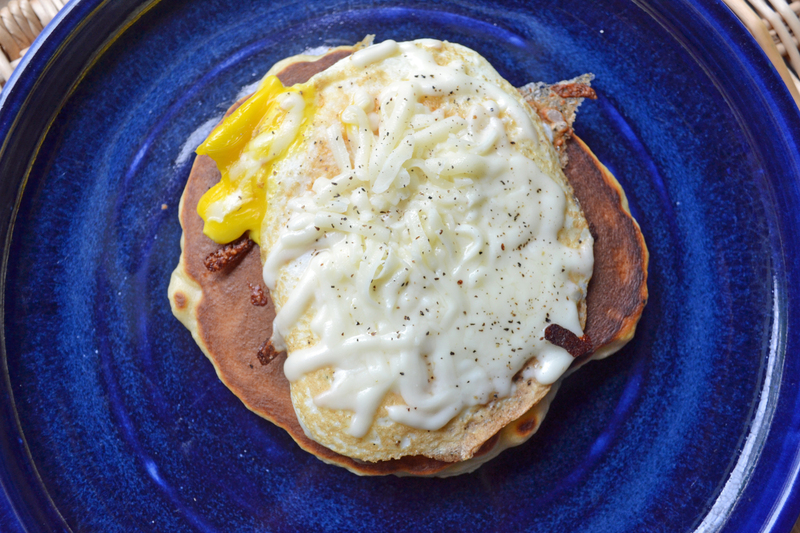 I didn’t have any sugar free pancake syrup, so I fried an egg and topped it with 3/4 ounce of mozzarella. I know it sounds weird, but the saltiness of the cheese paired well with the sweet and juicy blueberries. Breakfast comes in at 9 points. I have never been a big fan of chicken salad. Mostly because they are so mayo heavy just the thought of it made me kind of gag. But I saw a recipe for a grilled chicken salad with dried cherries that looked amazing, and I could control the amount of mayo. 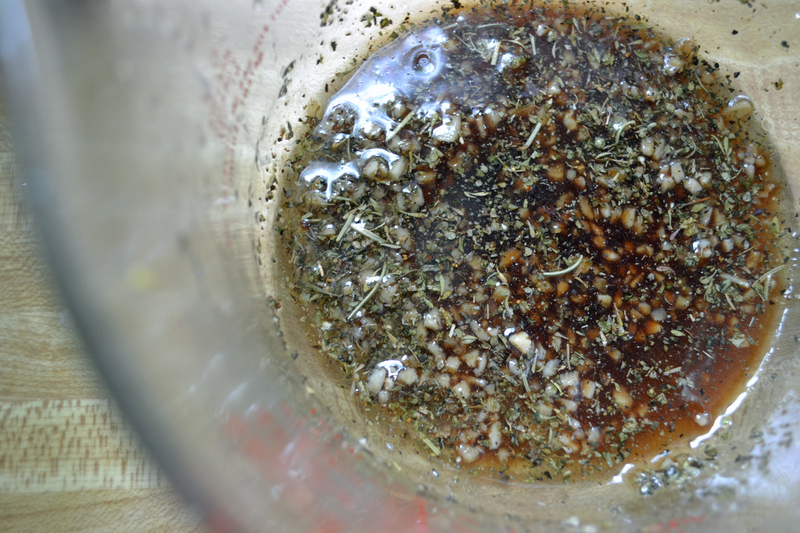 Combine the olive oil, vinegar, garlic, salt and pepper and Italian seasoning. Add to a ziploc bag, add chicken and marinate for at least an hour, but can be marinated overnght. Grill chicken, discarding marinade. When the chicken is cool enough, dice into bite sized pieces. 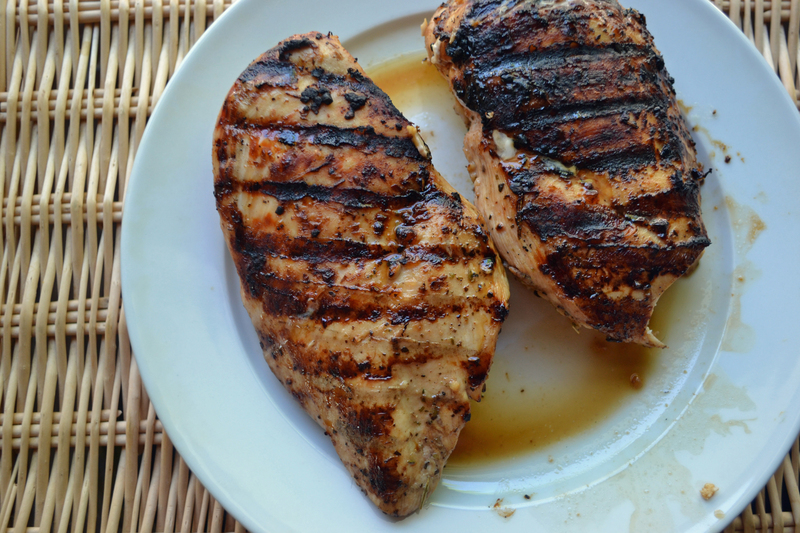 Combine remaining ingredients, add grilled chicken and toss. 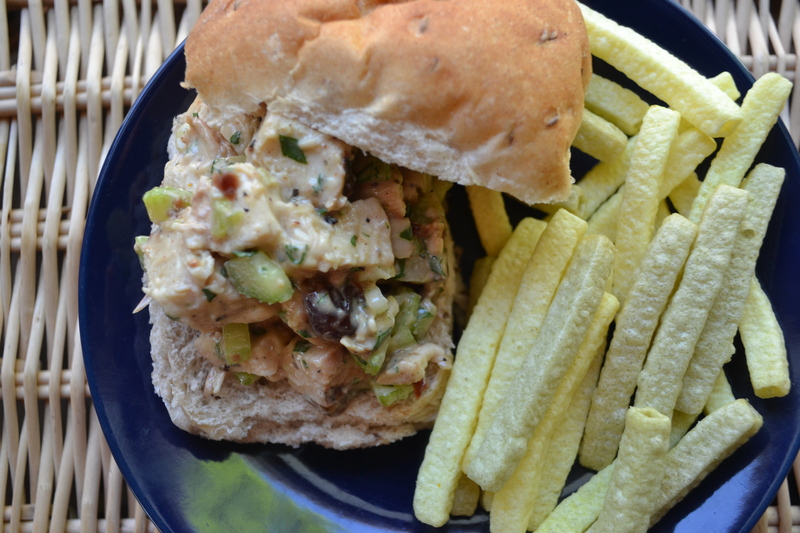 My lunch – 1/2 cup chicken salad on a 1 ounce dinner roll, an ounce of veggie straws and an unpictured cup of watermelon – lunch comes in at 11 points. I really liked this, the flavors melded even more overnight and I love the chewy dried cherries. Mom, I’ll have to make this for you the next time you are over. So I met my Mom and Hannah at Seasons 52 for dinner last night. I had no idea what to expect, but was quite surprised with the decor and it had a huge, beautiful bar – and a guy playing a piano and singing in the middle of the bar! There were no prices marked on the online menu, never a good sign, but I was presently surprised – most small plates/appetizers were between $4 and $9 dollars, and the most expensive entree was $16.95 – not bad! 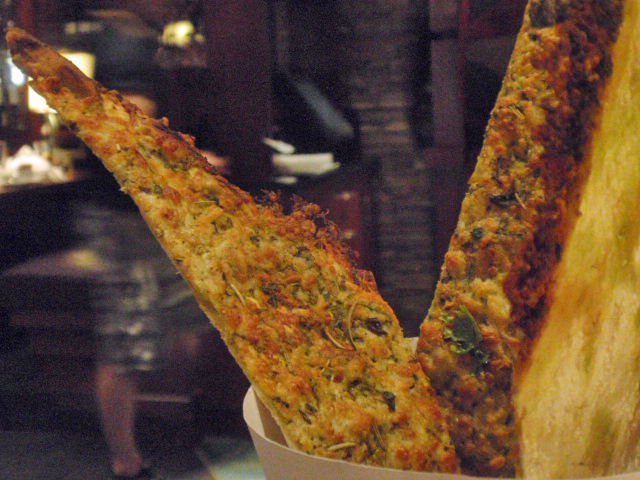 We started out with the parmesan and thyme flat bread – a whole serving is 9 points, so my 1/3 portion was 3 points. Anytime I see goat cheese on a menu, I am all over it. 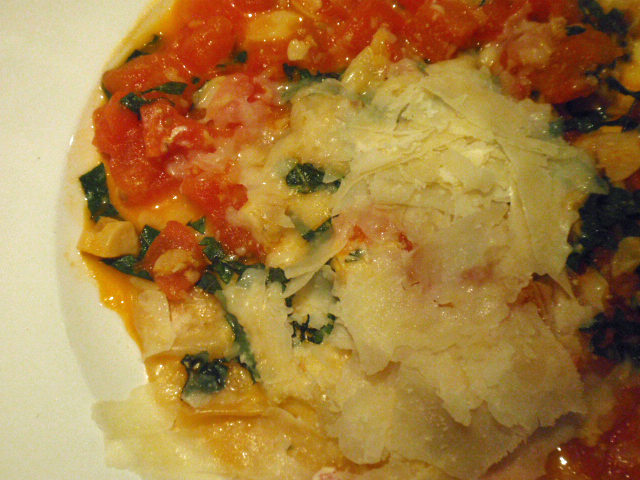 My Mom is a goat cheese lover too, so we split the appetizer portion – which was one giant ravioli. 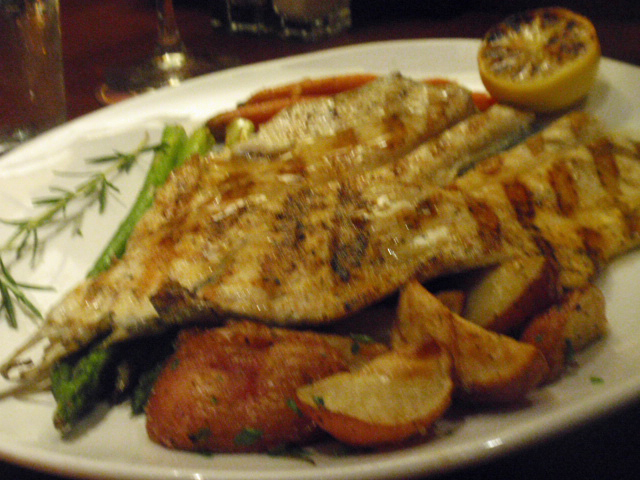 The whole plate is 7 points, so my portion was 3.5 points – heaven on a plate. The goat cheese was super creamy mixed with fresh basil and tomatos. I need to make goat cheese ravioli at home soon! For dinner my Mom got the trout, and though I am not much of a fish eater, this was good. Hannah, however, spit her taste out into her cloth napkin and needed a palate cleanser, stat! Hannah got what I can only call grown up chicken fingers. Probably from the age of 2 to about 17, the only thing she ordered no matter where we went, was chicken fingers. Italian restaurant? Chicken fingers. Mexican restaurant? Chicken fingers. 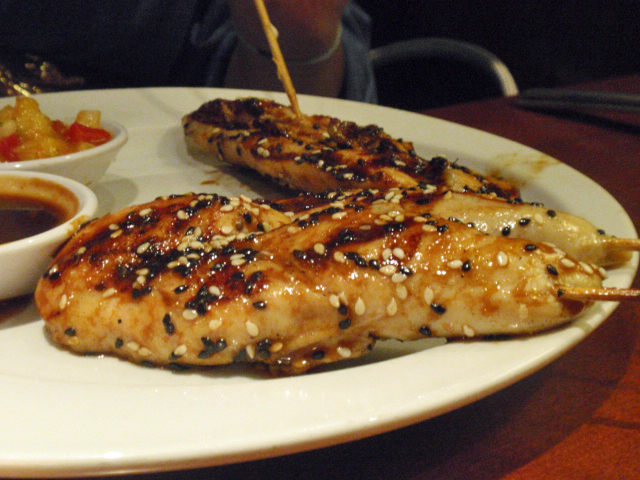 She got the sesame teriyaki skewers. 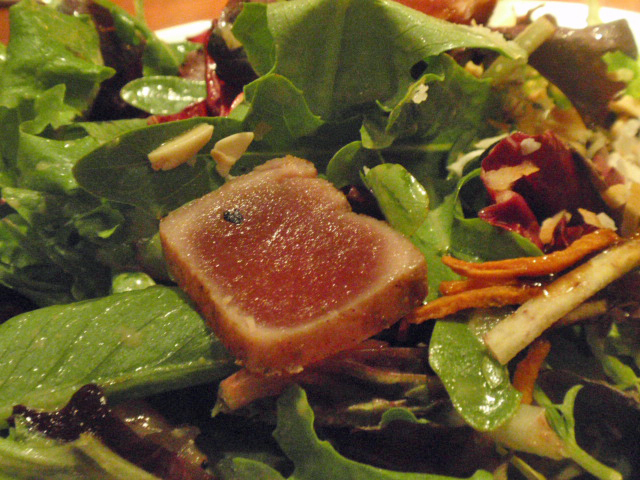 I got the maui tuna crunchy salad – the whole thing is 11 points, including the dressing. I ate about 2/3 of it, so I am calling it 7 points. For some reason I thought the tuna would be slightly warm, but it was cold – still delicious! 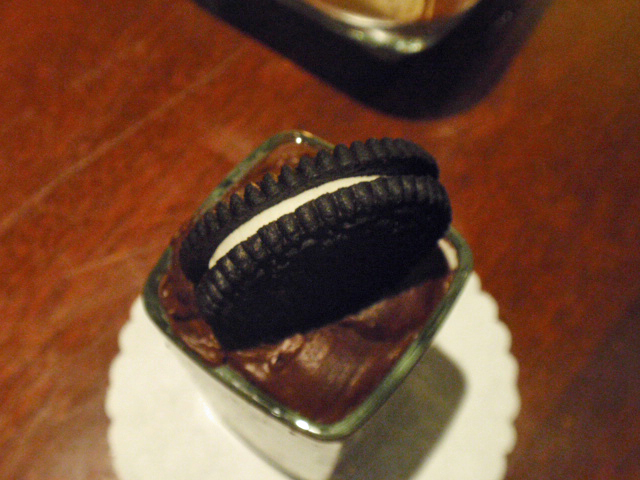 And while I am not a dessert person, they have things called “mini indulgences.” When he brought the tray over, I had to get the sugar free oreo cookie with no sugar added chocolate cake – holy shizz – this was so good and worth the 5 points! We have another couple of hot days in Chicagoland – temps near 100! I may need to take my lunch early today to get my bike ride in before it gets too hot!